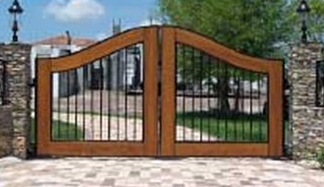 Double R Manufacturing specializes in custom entrance gates and operation systems. All are available in steel and aluminum and fully welded, beautifully designed, and structurally built to last. Custom features range from pickets, ornamental finials and scrollwork, to custom logos and lettering. Single or double gates that swing or slide can be custom designed for any application. Durable coatings are available from a basic black powdercoat to antique finishes in bronze, copper, gold and many other classic accents. You are invited to view our photo gallery of notable projects here on our site. For more information on how to get started designing an entrance to your property, contact us and one of our friendly representatives will respond as soon as is possible. 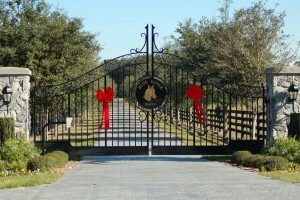 Click here for our Gates and Entrance gallery.